Silver bracelets of Italian production with a weave of korean, rolo, ankier, ball, royal and others. You will also find here celebs decorated with the symbol of infinity, heart, shamrocks, sun, angel, stars, moon and many more. It's great to wear every day, and it's perfect for evening outfits. Length: 18 - 20 cmWeight: 1.09 gColor: silverMaterial: silver, 925Clasp: silver, 925 attemptOther: a.. 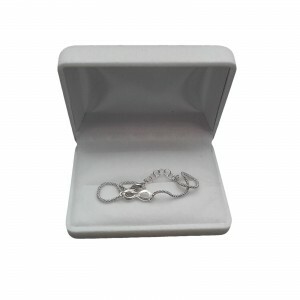 Length: 18 - 20 cmWeight: 0.97 gColor: silverMaterial: silver, 925Clasp: silver, 925 attemptOther: a.. Length: 18 cmWeight: 0.69Color: silverMaterial: silver, 925Clasp: silver, 925 attempt.. Length: 19 cmWeight: 1.1 gColor: silverMaterial: silver 925Clasp: silver 925.. Length: 18 - 20 cmWeight: 0.97 gColor: goldMaterial: gold-plated silver, 925 Clasp: gold-plated..
Classic delicate bracelet made of silver with a weave of rolo. It's great to wear every day, and it'.. Length: 18 - 20 cmWeight: 1.05 gColor: silverMaterial: silver, 925Clasp: silver, 925 attemptProduct ..
Delicate, silver bracelet with a Korean weave, decorated with a heart. It's great to wear every day,..
Delicate, silver bracelet with a weave, decorated with clover, star, angel and two hearts. It's grea..
Delicate bracelet made of silver with a weave, decorated with a hoop. It's great to wear every day, ..
Delicate, silver bracelet with a Korean weave, decorated with a moon and two angels. It's great to w..
Delicate, silver bracelet with a Korean weave, decorated with an asterisk and two angels. It's great..
Delicate, silver bracelet with a Korean weave, decorated with an asterisk. It's great to wear every ..
Delicate, silver bracelet with a Korean weave, decorated with a star's outline. It's great to wear e..
Classic delicate bracelet made of silver rhodium with a weave of żmijka. It was decorated with six b..
Classic delicate bracelet made of silver with a weave of żmijka, decorated with five balls. It's gre.. Elegant silver bracelet with a weave ball, Italian production. Thanks to the combination of five bal..
Delicate bracelet made of gold-plated silver, decorated with a small star. Made from a combination o..
Delicate, silver bracelet with a weave, decorated with three angels and four suns. It's great to wea..
Silver bracelet celebrity, decorated with the Mayan sun. Made of a delicate weave of an ankier. It's..
Delicate, silver bracelet with weave, decorated with two elements, zircon and clover. It's great to ..
Delicate, silver bracelet celebrity with a weave of ankier, decorated with zircon and heart. It's gr..
Delicate, silver bracelet celebrity with weave ankier, decorated with zircon and two hearts. It's gr..
Delicate, silver bracelet with a weave of ankier, decorated with an element with zircon, heart and c..
Delicate bracelet made of gilded silver with a weave, decorated with seven stars. It's great to wear..
Delicate, silver bracelet with a ankier weave, decorated with the symbol of infinity. It's great to ..
Delicate, silver bracelet with a Korean weave, decorated with the symbol of infinity. It's great to ..
Silver bracelet, ten rosary made of sterling silver 925. Delicate and subtle with beautiful beads an.. Call 500 401 104 and order by phone. Biżuteria srebrna i co do niej zaliczamy? We have been dealing with pearls for over 20 years. This shop was created from our passion so as everyone can see what a pearl is, which is always one of a kind. We choose perls straight from the breeding personally, therefore we do not have any intermediaries. Thanks to this all we can offer the highest quality pearls at competitive prices.